The airport in Hanoi was little more than a shack, in my memory. This might be an exaggeration, after all these years — but I remember arriving in the middle of the night, on the last flight in, and arriving to find a small terminal that closed behind us, using metal shopfront shutters that had to be pulled from overhead. We whizzed through the city, marveling at the quiet streets and dim yellow street lamps, before being deposited into a hostel that was really just a couple of rooms rented out of someone’s house. The airport has become a graceful building of steel and glass over the years, and international flights come in and out of Noi Bai every day. Build it, and they will come — or is it the other way around? In 2013, 13 million travelers went through the airport, even though it was only built for 9 million. At the end of 2014, the airport opened a new wing for international passengers; the airport is now able to take in 19 million people a year. No wonder that Hanoi, the bustling cultural capital of Vietnam, busy and startlingly cosmopolitan even then, has become even busier, with certain quarters filled to bursting with tourists from every corner of the globe. “Filipino? Kumusta?” savvy shopkeepers now greet me from within souvenir stores. The shops themselves have gained a contemporary worldliness, offering movie posters reimagined in hip, minimalist lines, right alongside reproductions of old Communist propaganda posters. 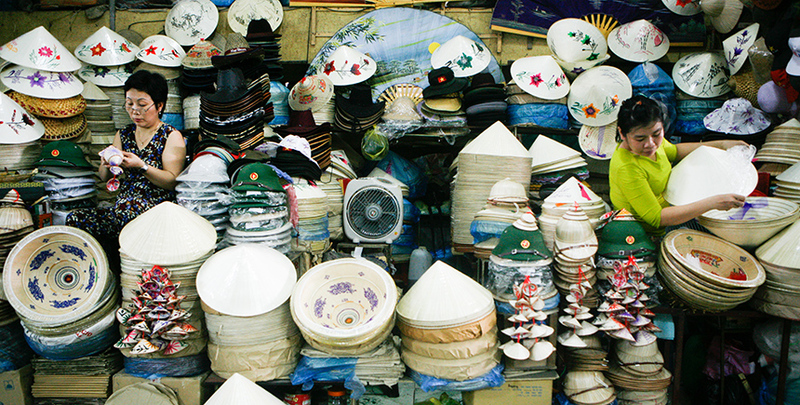 Sometimes it feels as if entire areas of Hanoi are tourist ghettos, stuffed full to bursting with comically varied tour groups, but the residents seem unfazed by all this, continuing to live their lives and ply their trades as ever they did. The ubiquitous motorbike — there are some 4 million of them in this city of 7.5 million people — is a fitting symbol for the way progress marches on, urgently and chaotically, though never too fast. “Airport?” the taxi driver asks as he helps load our bags into the back. The word for “station” is the one Vietnamese word I remember from the small number of trips I’ve taken here since my first visit. The North-South Railway, popularly known as the Reunification Express, runs the entire length of the country. 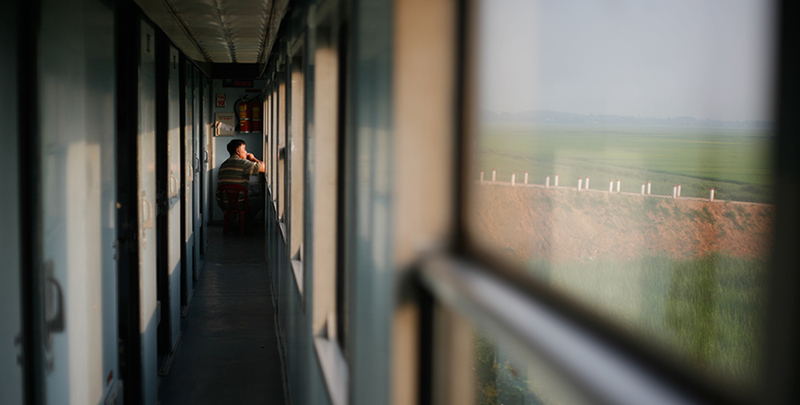 In Hanoi, many travelers take the train north to the lovely mountain retreats in Sapa, but few undertake the massive 35-hour journey (a mere 29 and a half hours on the faster express train) from Hanoi all the way down to Ho Chi Minh City. There’s no reason to do it unless you’re a fan of train travel; at $90 for the most comfortable “soft berths”, it can be even more expensive than a two-hour flight. “This is the most comfortable standard available,” assures the Vietnam Railways website. “Though it cannot be compared to European standards,” it hastens to add. The trip from Hanoi to Hue is a different story. I first traveled this route out of necessity, since the only other option, pre-budget airlines, was to take the cheaper but less convenient tourist vans. But the 12-hour trip was a revelation. If I’d needed another reason to fall in love with the country, the train ride was it. I’ve never traveled to Hue any other way since. The soft sleepers are basic, but really comfortable. With four beds to a berth, and bedding provided, it’s not a bad way to travel. On this trip, though, the soft sleepers were fully booked, and we had to settle for the slightly cheaper “hard berths”, which as far as I could recall weren’t actually harder than the soft berths; the main difference was that there were six bunks to a berth. We arrived to find the berth already fully occupied: there was a Vietnamese lady traveling solo on the bottom bunk, and another woman across her, with two young children huddled under the blankets. Two other foreigners each had the middle bunks, so we excused ourselves, and clambered all the way up to the top bunks, our faces less than a foot away from the ceiling. The trick to this particular train journey — and I will tell you the reason later — is to leave on the last train out of Hanoi, which leaves at 10pm. It wasn’t too long before the discomfort of the jam-packed berth made someone giggle softly. Laughter was a language we all spoke, so before long, everyone had their heads sticking out from their bunks, and we were trading small gifts of food among ourselves, and smiling as the children each selected a fruit and happily retreated to their corners. The city faded into the suburbs, and the suburbs gave way to fields as we all started to drift off to sleep. The train would make half a dozen stops along the way, each one blearily acknowledged. Our Vietnamese friends had each departed on separate stops during the night, sent off with sleepy waves and well wishes. The trains run more or less on time, so it’s always the same: the dawn breaks, and someone always stirs awake to check where we are. There is always a gasp of surprise. We are in the mountains when the sun rises, and the view — of dramatic montane passes, misty jungle and sweeping valleys — is as unexpected as it is stunning. Everyone wakes to take it all in, and for a swift hour or so, until the sun goes up and the train makes it way down to the other side, there is only awe. 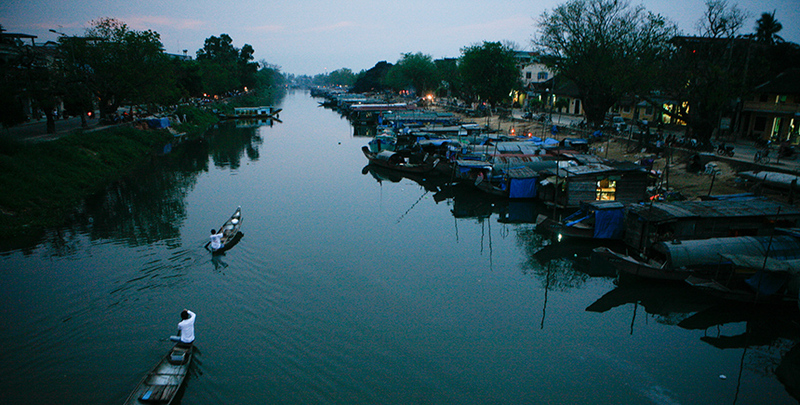 By the time the train pulls into Hue, you’ll be more than ready to leave the train. Fortunately, the reward for this 12-hour trip is by far my favorite city in the country. 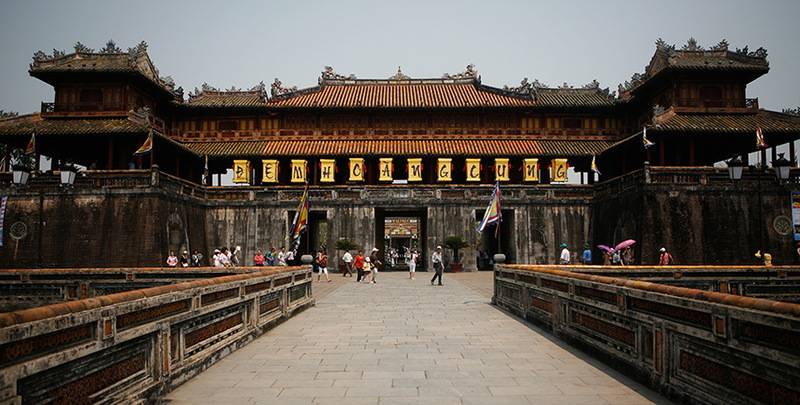 Hue, located in the middle of Vietnam, is steadily gaining popularity among travelers as the growing number of short-haul domestic flights from either end of the country has made access far more convenient. 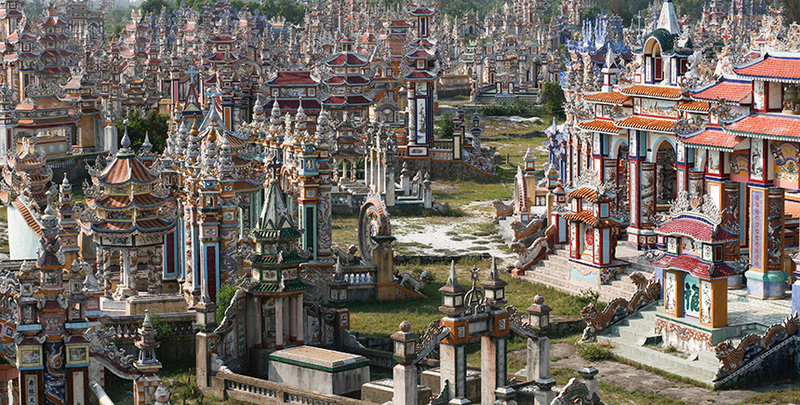 Not that the city has ever wanted for visitors — even 20 years ago, Hue was already a major tourist draw. But while the entire country has become more cosmopolitan with the influx of foreign visitors, this one-time imperial capital and seat of the ruling Nguyen dynasty still remains curiously insulated from the breakneck changes being witnessed in Hanoi and, most especially, further south in Ho Chi Minh City. Much of Hue, by contrast, feels relatively unchanged, even in the tourist centers; there are more hotels and many more tourist-oriented restaurants, but the core remains essentially the same. Taxis are ubiquitous now, we found, though bicycles and motorcycles remain the best way to get around. Walking is an option, of course, and while Hue does not have the tree-lined streets of Hanoi, the bridges that span the poetically named Perfume River are ample reason to get out for a stroll to the opposite bank. The city, incidentally, began to light up the main bridge about 10 years ago — not as gaudy as it sounds. 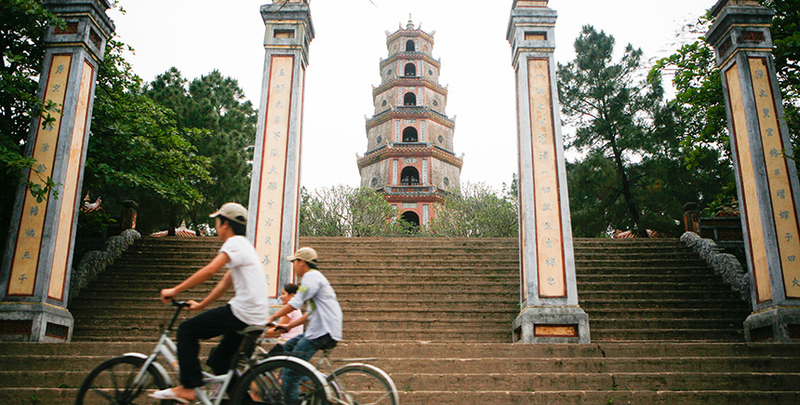 It’s a quiet but spectacular way to celebrate the river that separates the Imperial Citadel (Thua Thien Hue Province; +84 54 3501 143) from the rest of the town. Hue seems to have a knack for preserving things. The Citadel still stands as a UNESCO World Heritage Site, and while teams of workers and scientists struggle to preserve what remains of the Forbidden City inside, the other areas within the old fort have adapted to modern times more gracefully, offering everything from “Made in Vietnam” items (export overruns perhaps, if not outright copies) to coffee and WiFi. Ironically, outside the Citadel, there is more that remains unchanged. Lac Thien (6 Dinh Hoang, +84 54 3524 674), a restaurant famous among generations of backpackers, stubbornly remains a hole-in-the-wall affair, for example. Mr. Lac still makes his beer-bottle openers from a nail stuck on a piece of wood, still makes a show of flipping bottle caps open, and still gives away the contraptions with his autograph. The menu remains pretty much unchanged, though he and his family must have made millions of Hue-style spring rolls and banana pancakes by now. Across the river, the Hotel Saigon (30 Le Loi St; +84 54 3823 526; www.morinhotel.com.vn) still stands as a fine example of French colonial architecture — it’s tempting to imagine that it has changed little since it was first built in 1901, though of course the reality is that it was destroyed during the Vietnam War, and rebuilt only in 1997. Still, the renovation was pretty faithful to the original Hotel Morin, and it remains a quiet, elegant presence in the city. 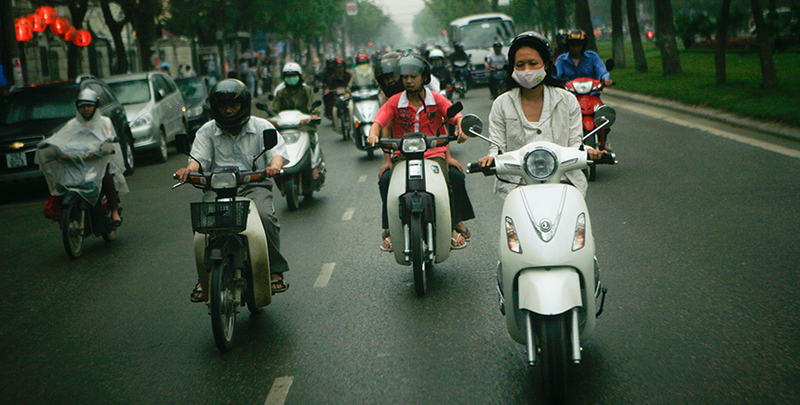 Riding on rented motorcycles into the rural areas outside Hue proper, however, the changes can stand out starkly. On the 20-minute ride to Thanh Toan Bridge, for example, the pleasant stretch of dirt road in the middle of rice paddies is now gone, replaced by a six-lane highway still dusty from construction. Travel on the deserted highway on a motorbike is, literally, a rush (“Go!” our tour guide motioned at one point, grinning as we pushed our mopeds to the limit), but to be perfectly honest, I missed the lonely, bumpy roads that the highway had replaced. Change comes everywhere, though, and sometimes in the most unexpected ways. At the old Japanese-style bridge, we took off our helmets while we had a breather and sat down for coffee, gazing at the 240-year-old construction. The schoolgirls who had also come to the tile-roofed bridge for a little shade came to sit with us, asking if they could perhaps practice their English.